PWD rep. for western Uganda Hood Katuramu receiving copies of the Constitution and House rules of procedure from Speaker Rebecca Kadaga. Courtesy photo. Two representatives of Persons with Disabilities (PWDs) have taken oaths of administration at Parliament. 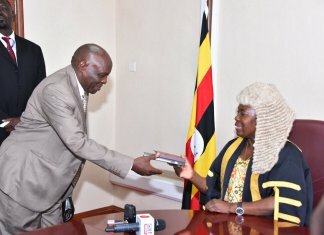 Hood Katuramu PWDs representative for Western Uganda and William Nokrach, representing Northern Uganda were on Tuesday afternoon sworn in by the Clerk to Parliament, Jane Kibirige. The oaths were witnessed by the Speaker of Parliament, Rebecca Kadaga. The duo were kicked out of Parliament in May this year, after the Court of Appeal overturned their election on grounds that they lacked requisite academic qualifications, as well as bribery of voters. 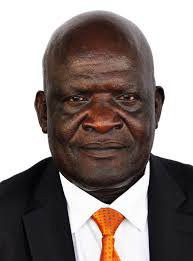 PWD rep. for northern Uganda, William Nokrach. Net picture. The justices then ordered the Electoral Commission to hold fresh elections. In July, the Electoral Commission conducted by-elections where the two MPs emerged victorious again. Shortly after taking oath, the legislators spoke about their next four years in the 10th Parliament, focusing on lobbying for more friendly laws for persons with disabilities. “We had programmes for our people which were ongoing and we had hardly spent a year in Parliament. Our constituents have been waiting for this day to ensure that we have continuity in what we have been planning for them,” Katuramu told journalists.